Three years of peace have followed the Earth Federation's victory over the Duchy of Zeon. 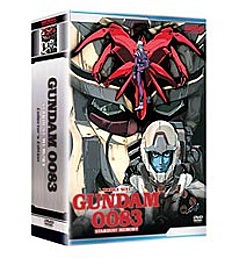 Now, in the year 0083 of the Universal Century, the last remnants of Zeon begin their plan for revenge by stealing a prototype Gundam armed with nuclear weapons. Can rookie Federation pilot Kou Uraki challenge the legendary Zeon ace Anavel Gato and prevent the cataclysmic rebirth of Zeon? Mechanical Designs by Shoji Kawamori (Blue Sub. No.6, Cowboy Bebop and The Vision of Escaflowne), Character Designs by Toshihiro Kawamoto (Cowboy Bebop, Escaflowne: Movie, Wolf’s Rain and Witch Hunter Robin). Contains the complete series on 4 DVDs! DVD Features: Clean Opening and Closing Animation, Mobile Suit Gundam Encyclopedia Animated Short "The Mayfly of Space," Image Gallery.